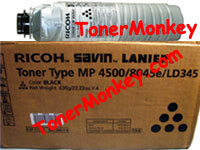 Ricoh copier staples shown below are recommended for the Ricoh Finish / Stapler that fit these Ricoh models. Staplers and Finishers are dealer added options and it is possible that your machine may have a different stapler / finisher model which will take a different staple cartridge than the one suggested by the manufacturer. Confirm your Ricoh Stapler and/or Ricoh Finisher Model No and Ricoh Staple Cartridge part number prior to ordering.